Busy week for the fashion lovers, specially for the ones keen of couture. Yesterday was the night of the SAG awards in LA where we could see plenty of gowns shown with the best jewellery. Not only actors, but last nigh, on the other coast of the USA, in Florida, a representantative of each county competed for the Miss Universe crown. But lets start with some of the best red carpet looks from the SAG awards. I always like to start with black, and this is no exception: Sarah Paulson in Giorgio Armani, Emma Stone in Christian Dior, Julia Roberts in Givenchy, Sarah Hyland in Vera Wang and Rosamund Pike in Christian Dior. White: Maggie Gyllenhaal in Thakoon, Reese Witherspoon in Giorgio Armani and Viola Davis in Max Mara. It´s not black it looks like, Blue : Amy Poehler in Jenny Packham and Naomi Watts in Balenciaga. or Violet: Keira Knightley in Erdem and Camilla Alves in Donna Karan with Matthew McConaughey. 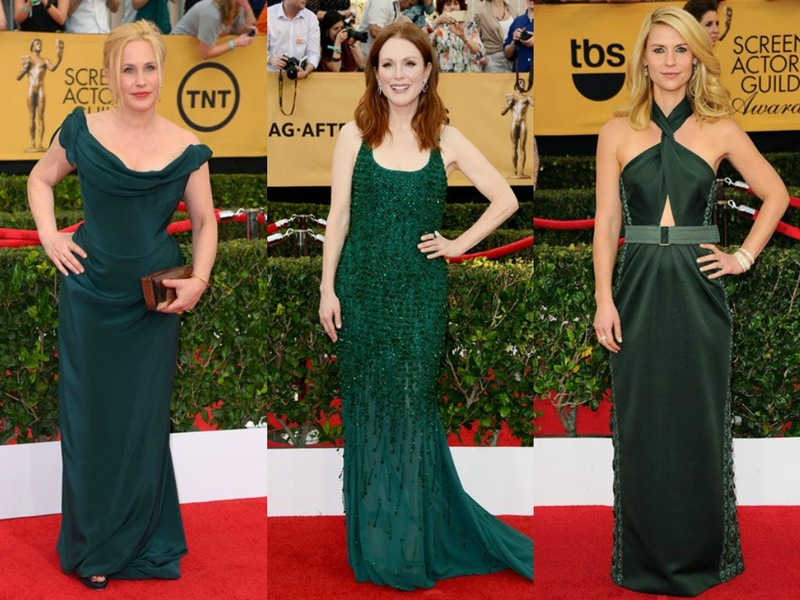 or Green : Patricia Arquette in Vivienne Westwood, Julianne Moore in Givenchy (my fave), and Claire Danes in Marc Jacobs. some opted for a winter version of Red: Gwendoline Christie in Giles, Sophia Bush in Vivienne Westwood, but not Sofia Vergara who opted for a vibrant red dress by Donna Karan. On the other hand we have some pastel colors specially pastel pink: Joanna Newsom in Zac Posen with Andy Samberg and Felicity Jone in Balenciaga. 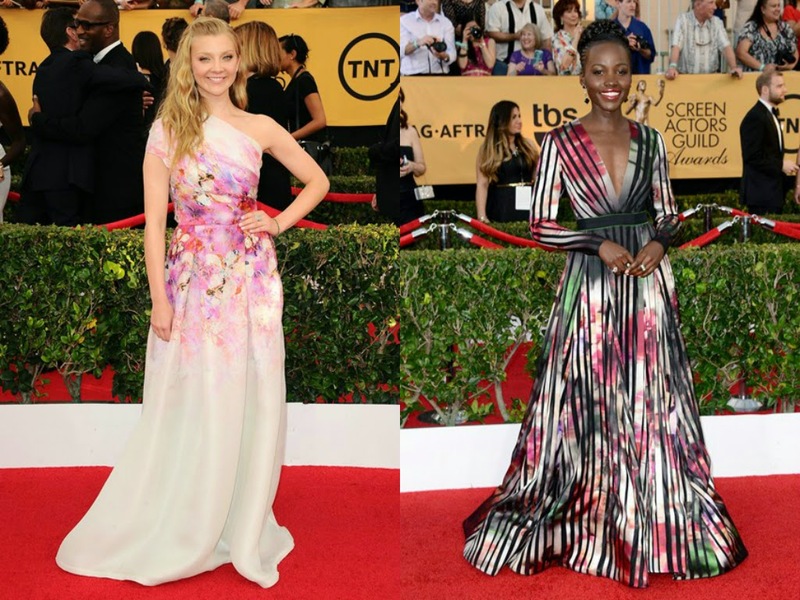 Going on with the spring topic, we have the floral prints: Natalie Dormer in Naeem Khan and Lupita Nyong'o in Elie Saab. No need of prints when your dress cloth has lace cut outs: Uzo Aduba in Angel Sanchez and Jennifer Aniston in vintage John Galliano. Neither when it has a delicate gemstones embroidery: Gretchen Mol in Dennis Basso and Julie Bowen in Georges Hobeika. Any favourite? I really liked Julianne Moore as soon as I saw her, she´s doing great on this award season, I mean she was one of my best dressed for the Golden Globes as well. On the second place I would put Julie Bowen, who opted for a delicate gown that I would definitely wear. And third Jennifer Aniston, who risk it by wearing body jewellery, so original and is not out of place! In other words, a huge congratulations to Miss Colombia on becoming Miss Universe. In fashion words, I´ve never seen so much sparkle than in this show! As I told you before, if you like couture gowns, don´t be sad, because this week you´ll be seeing the new Spring 2015 Couture collections, presented this week in Paris including designers such as Dior, Chanel, Elie Saab and more.